Will you survive the trail? Or die of dysentery? 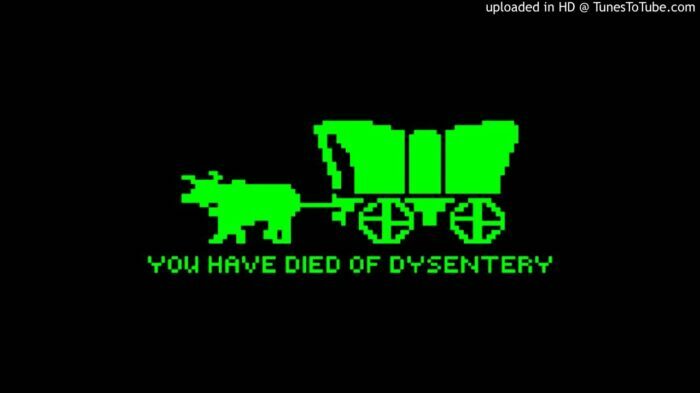 Test your luck at the Live Action Oregon Trail game! Independence, Missouri, served as the launching point for many moving west. The game, a partnership between the Jackson County Historical Society and National Frontier Trails Museum, highlights the challenges facing settlers moving out across the Oregon Trail. Teams of 4 will see if they have what it takes to survive the Oregon Trail! There will 10 stops along the way with games, trivia, and relay races. Teams will pack their wagon, “hunt” wild game, and much more! Each team has the chance to win points at each stop. The team with the most overall points wins Live Action Oregon Trail! We will also have a prize for the best-dressed team.